Thank you to the Chattanooga Creative Arms machine quilters group and Bernina Sew-N-Quilt Studio for allowing me to co-host a fabric party featuring 108" wide backing fabrics. Machine quilters examine Blank Quilting 108" wide backing fabrics. 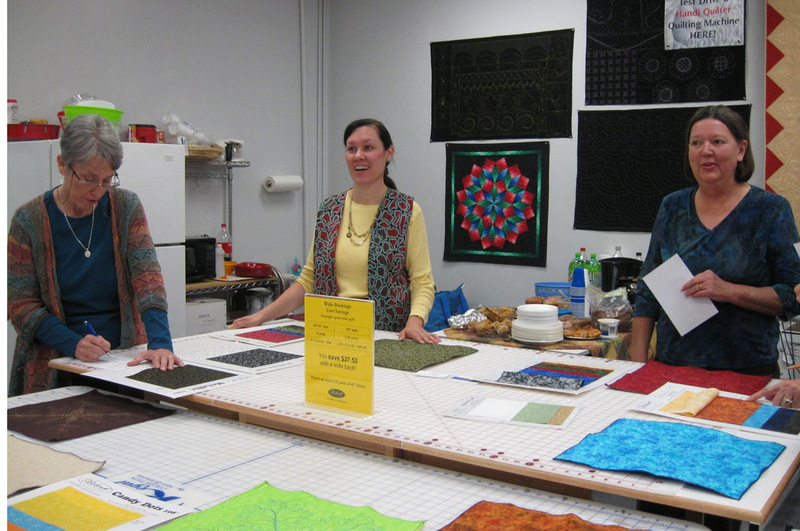 The Creative Arms group is comprised of machine quilters in the Chattanooga area. 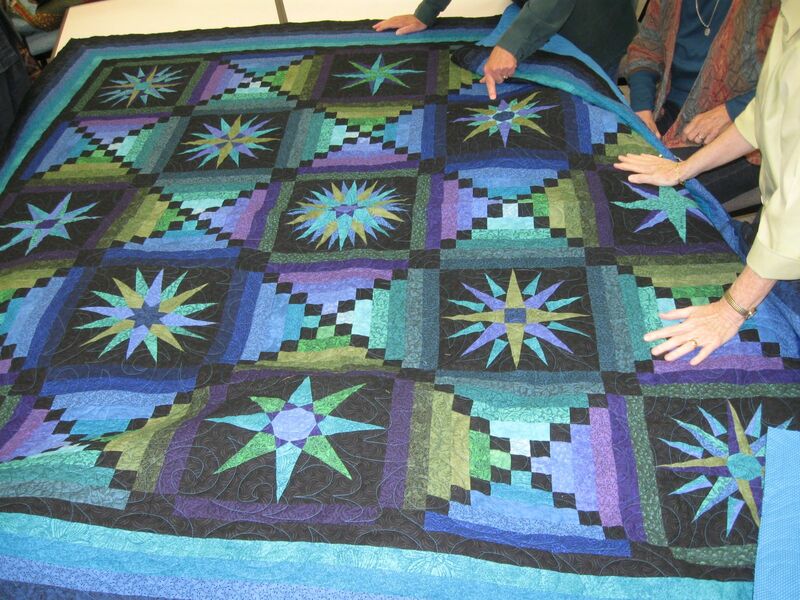 They are quite diverse in their quilting methods as a show of hands indicated those attending the fabric party quilted using long-arms, mid-arms, sit-down quilting machines, as well as domestic sewing machines—for both free-motion work and with a walking foot. for attendees to see, touch and feel. a good solution for the [admitted] "lazy" quilter who doesn't like to piece or wrestle with the backing. Don't you just love having these kinds of discussions with experienced quilters? 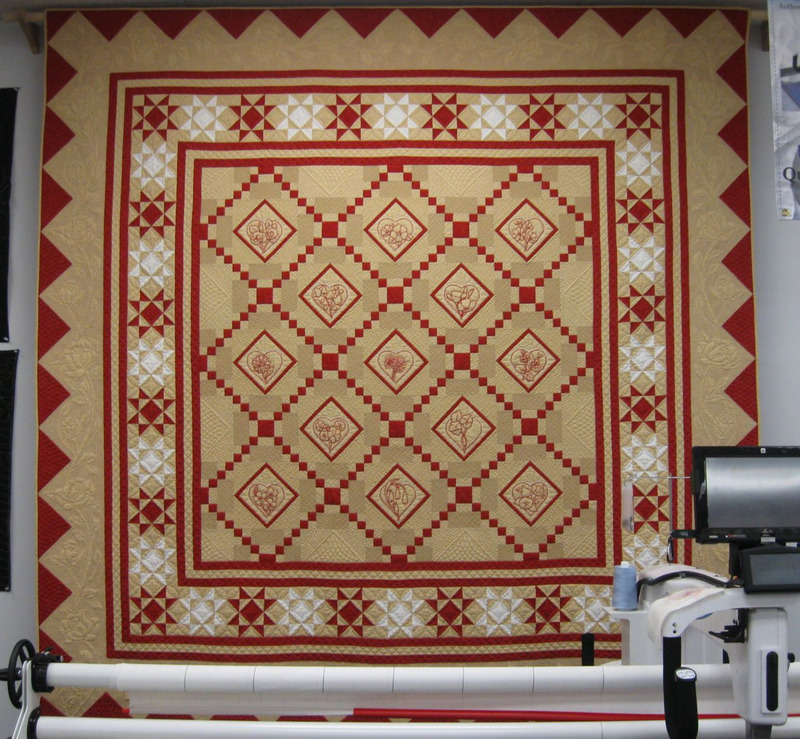 As someone who machine quilts by "pushing" the quilt sandwich beneath the needle (yep, I'm a pusher), it was interesting to hear how the other half (the "drivers" that drive the needle over the quilt sandwich) works. It was a great exchange of ideas! And, I'll share other ideas for using wide backings in a future post. 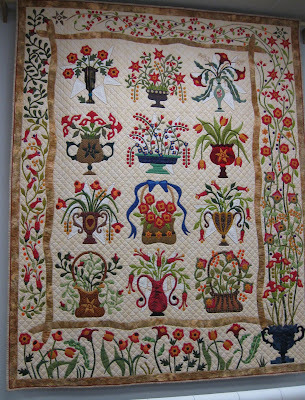 TQS BOM appliquéd and machine quilted by Margo Clabo. The backdrop for the meeting was just as appealing as the lively discussion. 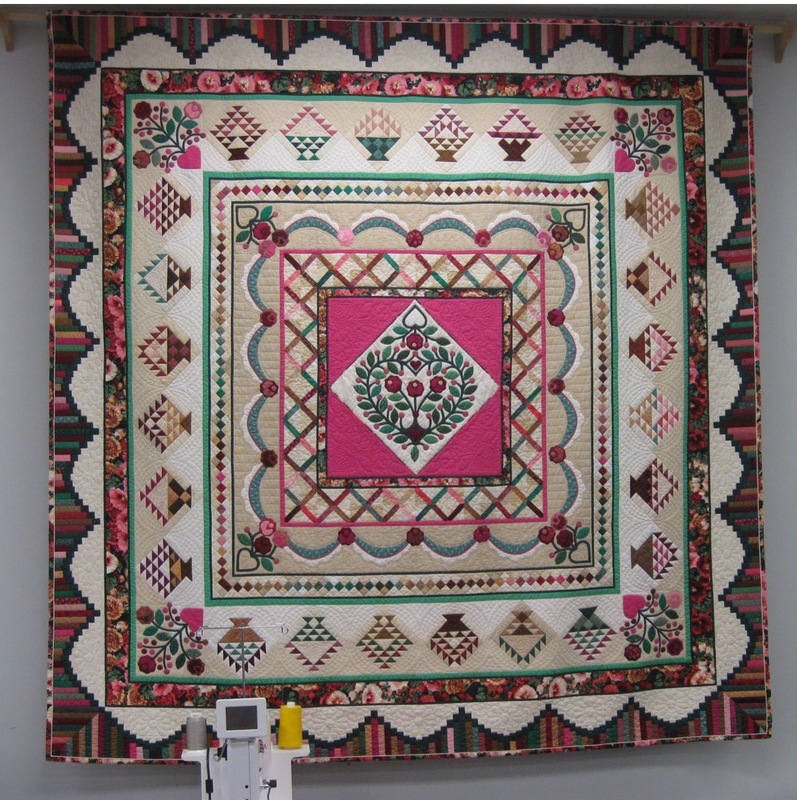 Check out these exquisite quilts that currently hang in Bernina Sew-N-Quilt. 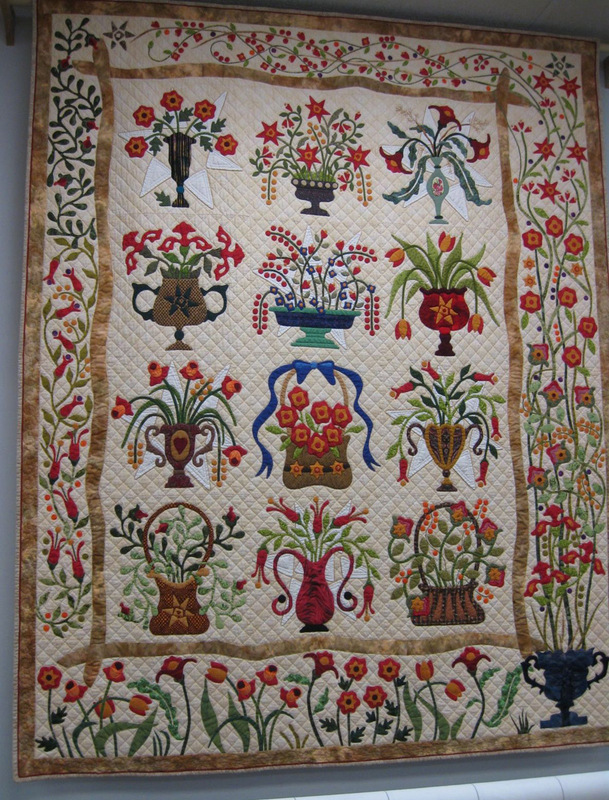 These pieced and appliqué beauties were made and machine quilted by Margo Clabo. Look familiar? 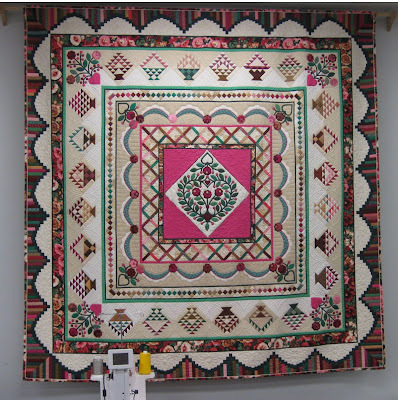 If you are a member of The Quilt Show (TQS), you may remember these as previous BOM programs. Margo's work is absolutely fabulous! 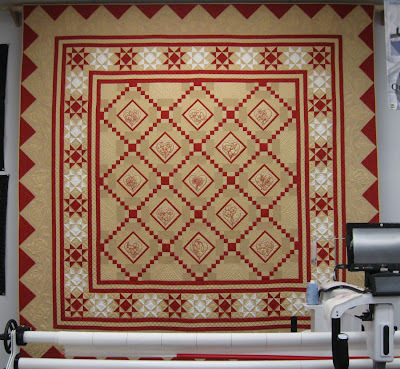 TQS Block of the Month quilt by Margo Clabo. 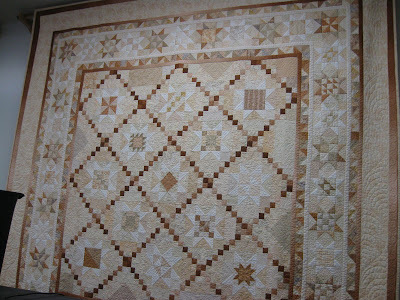 Star quilt done in neutrals by Margo Clabo. And, of course the Show and Tell by the Creative Arms members is always enjoyable and inspiring. An appliqué quilt in progress. 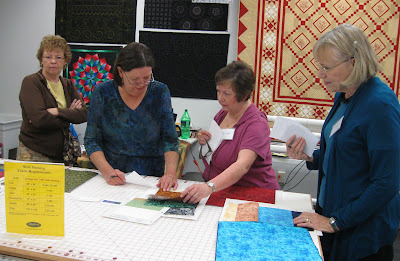 Attendees offered suggestions for machine quilting background patterns. 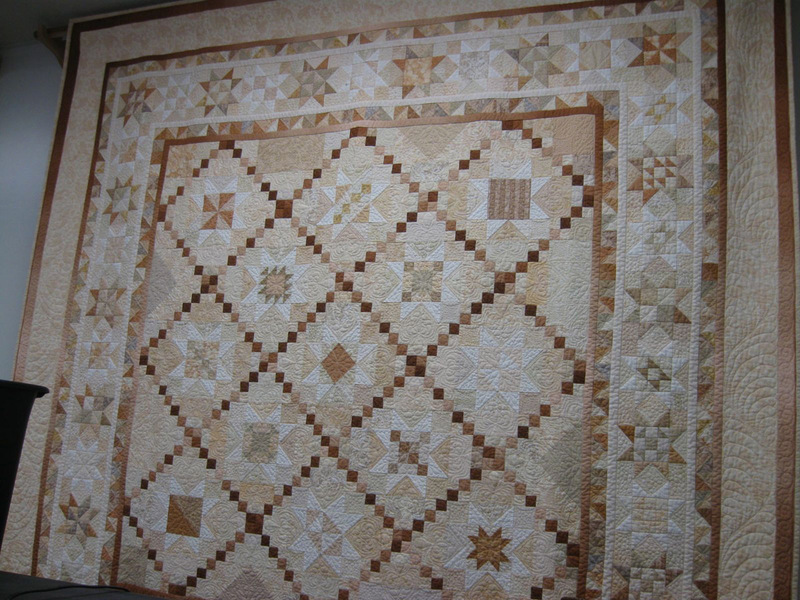 A star quilt made with Jinny Beyer fabrics. A savings of $33.50 or nearly 3 yards of extra 45" fabric! Thanks for a fun, informative program Veronica! Looking forward to getting my wide backs! Great to see you again, Margo! Your work is amazing and I can't wait to see your next quilt using the new wide backing fabric. You said you'd be interested in what kinds of backings people would be interested in. I'm a "modern" quilter (whatever that means) and work mostly with bright, clear color. 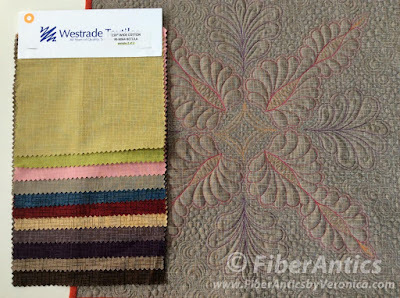 My preferred backings would be versatile, able to work with many different fabric lines. So, basics like dots, stripes, plaids, crosshatch, gingham, zigzag, etc, in a rainbow of colors and white would be awesome. Also a text print would go over well I think. Ikea has a print with a white background and black text spelling out numbers (nineteen, twenty, seven, twelve, etc) that seems to sell pretty well in the modern quilt community. It's kind of large scale and works well for a back, except it's 44" wide and pretty thin. So yeah, I think a text based print would work well as a backing. Also, playing with scale of print would be nice. 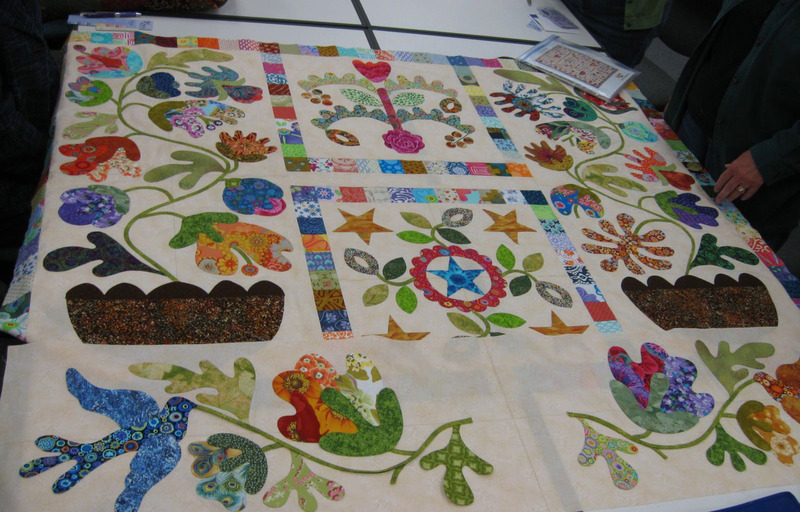 A quilt back is a large canvas, so have fun with it! There are some wide backings that are 120" wide. Fabric companies have to find a mill that has equipment that will accommodate wider widths. I make a lot of throw and twin size quilts always have them quilted for me. I love wide flannel backing for us Northerners- adds a nice bit of cozy so would like to see more variety in wide flannel backings. I am looking for a yardabe conversion chart for 45 inch to 108 inch.